May 31, 2007, 9:40 PM · NEW YORK - A full moon hangs over Manhattan tonight, and I watch it between the skyscrapers, from the 44th floor of the Hilton New York. The Starling-DeLay Symposium on Violin Studies has me totally exhausted. 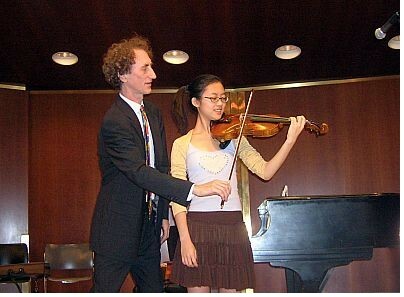 But over at Juilliard, violin pedagogue Simon Fischer is still giving his morning lecture on "The Basics of Intonation." "You'll have to finish by 11 p.m.," warned Juilliard administrator Rob Ross. Of course, Fischer hasn't actually been talking since 9:30 a.m. (though I suspect no one would have complained, or stopped him, if he had been). The well-known author of Basics and Practice, and of 195 columns for The Strad, simply wasn't able to finish his lectures during his allotted two morning sessions, and he generously offered to continue the lecture after the evening recital. "My goal is very, very high. My goal is to change your life,"" Fischer said at his lecture "The Basics of Tone Production." Fischer is also working on a new book, "The Violin Lesson," to be published in 2008. "If you are a player and you don't know these exercises; once you know them, your life changes," he said. "If you are a teacher and you don't teach these, and you start to teach these, your student will take off like a rocket. You can take a scratchy 12-year-old, and within 10 to 15 minutes you can get them playing with a cultured sound. I've done it thousands of times." He turned to his student for the day, Michelle Shin. He asked her to play something, just to see where she was at. "I tell you I can fix any car. Give me a wreck of a car, and I can make it go. And you give me a shiny BMW!" he said of her well-played Sibelius. But did she know the mechanics of tone production? "What does the hair of the bow do to the string?" Fischer asked her. "Most people say it makes the string vibrate." Actually, the hair of the bow catches the string and pulls it sideways, then releases it. It's possible to show this by putting the bow to the string, and pulling sideways just barely until it releases, making one tiny "tick." "Let's play tennis," Fischer said. "I'll serve." Tick, went Fischer's violin. Tick, Michelle's. Tick. Tick. Tick-tick. The French words for "up-bow" and "down-bow" actually are "pull-bow" and "push-bow." "The string is swinging from side to side under the bow hair, this is called the amplitude," Fischer said. If you press the bow too hard, "it inhibits this swinging under the hair. So, use speed, not pressure, to create tone. His first exercise, which evolved from an exercise Dorothy DeLay taught her students (including Fischer), involves playing whole bows at each of five sound points on the string. Suzuki teachers talk about the "Kreisler highway," the road the bow travels on. Imagine it has five lanes, with the closest one right by the bridge. These are the five sounding points. He took a moment to correct Michelle's posture, "I lengthen my back by flattening my fiddle, and I flatten my fiddle by lengthening my back." She started on soundpoint (or lane) five: the lane closest to the fingerboard. (DeLay used these numbers in reverse, Fischer said.) She played, then he demonstrated, using her bow on the violin under her chin. He asked her to look for the swinging of the string, the amplitude, and try to make it as wide as possible. Also, listen, feel the bow in the string, and think. "See how wide I'm making the string go?" Fischer said. "Listen for the ring." The violin is a resonating box, he said, and the soundpost transmits the sound into the violin. But try thinking of the ROOM as a resonating box, with the fiddle being the soundpost, or the vibrating string. "You play the violin in the room," he said to Michelle, "You should play the ROOM." Even with very advanced students, lessons in basics are important. He remembers DeLay, giving a lesson to the young Midori, who had played the Chausson "Poem." "She played it so well, I was nearly on the floor," Fischer said. "What did DeLay do? She showed Midori's mother how to line her up in front of a mirror to draw a straight bow!" "You give the same lesson to a beginner as to an advanced student," Fischer said. "If it isn't simple, you haven't broken it down enough. If you want to be a genius teacher, just say very simple things." For example: "Just put the bow on the string, without doing anything else," no hunching over, no shoulder going up, no physical drama. "That is actually very profound." When playing on the five sound points, "Let the bow play with its own momentum, and follow it," Fischer said. "The hand goes with the bow. Follow the bow and let it play." "The bow has this wonderful bendiness," Fischer said. "We don't use the bow, we use the forces inside of it." The string on the violin is springy. The hair on the bow is springy. The wood of the bow is springy. "You put these three springinesses together, and you get a wonderful contact," Fischer said. As Michelle got closer to sound point two and one, right next to the bridge, Fischer observed that she had scarcely any rosin on the strings there. "Evidence of non-use!" he said. Fischer asked her to play right next to the bridge. He observed that when there is not enough bow pressure one hears high-frequency, glistening sounds. When there is too much pressure, there are low-frequency, scratchy sounds. She drew her bow, at first with some glistening sounds. He coached her through: "More pressure, faster, less..." She made a nice tone, right by the bridge. "I didn't think that was possible!" Michelle said. Those three ideas, speed, pressure and distance from bridge, can be used to diagnose and correct just about any tone production issue. "Dorothy DeLay said that every sound that comes out of the violin can be described in just a few words," Fischer said. The goal is total purity of sound. The "Pressure Exercise" involves starting with a heavy bow and lightening it. One starts by doing once using the whole bow, then doing it twice in a bow, three times, and up to 24. The "Speed exercise" starts with a burst of speed and slows, and again one does it with one bow, then two to a bow, etc. "If you can get speed, pressure and sound point right, you can play a note as well as anyone in the world can play that note," Fischer said. "You can say to yourself, at least I can play one note as well as anyone in the history of the world. It's a good starting point. You've arrived, you are playing the violin for that one note." As for bow changes, Fischer advocated NOT doing any fancy finger movement. "It's something you want to throw out the window," Fischer said. He quoted Flesch as saying, "If it can be seen, it can be heard." "There's a danger of increasing the bow speed just when you want to slow it down at the bow change," Fischer said. Fischer did talk a bit in his morning session about intonation. He asked for his student and audience to listen for the pulsing as he played a D against a Db. Many people never really notice this pulsation. "When Dorothy DeLay first played this for me, I said, 'What? What?' And I still couldn't hear it," Fischer said. "I only know about it because it was pointed out to me." A perfect unison, which happens in tuning the fifths of our violins, has no beats, or pulsations. Fischer also spoke of the violin's resonant notes, E's, A's, D's and G's, which vibrate in sympathy with open strings. "It's like tuning to a radio station: a little this way, a little that way, got it," Fischer said. "In this way, intonation is part of tone production. You can make anything vibrate like a Strad this way." "When the note isn't absolutely smack-bang where it should be, it gets a hard, quality, a dead quality," Fischer said. There is a soft center to the note when it is in the right place. And with the other notes, using expressive intonation, generally sharps lead up and are thus played higher. Flats lead down, and are thus played lower. If you play everything tempered, it becomes all neutral," Fischer said. In general, one must work at technique every day in order to have it. "It's nonsense that if you are born gifted you can just play," Fischer said. "Anyone who is very good has worked very hard." June 1, 2007 at 03:34 AM · Laurie, I love you!!! Thank you so much for all this. Especially all the video! This makes me want to pull out my Simon Fischer books and read it from cover to cover and apply it to my own playing. June 1, 2007 at 09:06 AM · Fantastic Laurie, just fantastic! Laurie - this is just great! June 1, 2007 at 10:02 AM · Beautiful coverage, Laurie! You are working so hard! Thank you for your efforts to catalogue all the ideas coming forth from the symposium.Brava! June 1, 2007 at 10:20 AM · Thanks, you guys. Off to the next one! Later today on v.com: Mimi Zweig. June 1, 2007 at 10:47 AM · Wow - even from a novice's point of view, this all makes sense. Thanks for the wonderful write up. Makes me feel like I was there. Thanks a million for posting all of this information! All of it is extremely helpful! Sounds like you're having a fabulous time there! June 1, 2007 at 11:22 AM · Thank you so much, Laurie! June 1, 2007 at 02:16 PM · Yes, that would be wonderful to have the masterclasses in their entirety on video so that we could see them. The Manhattan School of Music has done this type of thing with videoconferencing and webcasts. They have a series of masterclasses by Pinchus Zuckerman. The classes are all great! It would be wonderful if Julliard could do the same thing. And if the videos could be made available for sale, that would be even better. June 1, 2007 at 02:21 PM · Thanks, Laurie! I'm really impressed at your ability to observe these classes and put them into a well-written and easily understandable format for us. THAT takes work, too! Thank you again for sharing these. June 1, 2007 at 04:26 PM · Does Simon Fischer teach in New York regularly? If not where does he teach? June 2, 2007 at 12:30 AM · Oh Laurie, you amazing woman! I hope you will compile all these wonderful pieces into a collection of a book and sell it at the V.com and Shar. I'll be among the first group to buy it. Seriously. June 4, 2007 at 10:35 PM · Great stuff! I'm really enjoying this series!! June 5, 2007 at 03:18 AM · Thanks so much for this series, Laurie. Reading your blogs is almost as good as being there. It must be a really exciting experience.